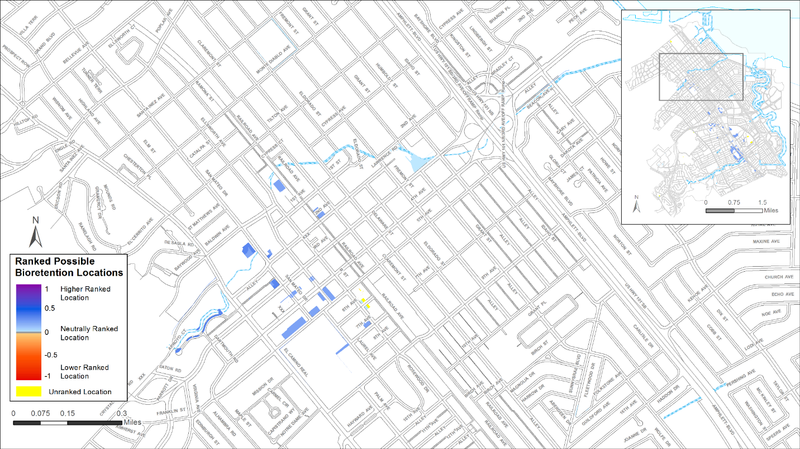 The City of San Mateo was one of two primary municipal partners in the development of the GIS Site Locator Tool. San Mateo is a city on the San Francisco Peninsula with a population of about 100,000 people. When the Green Plan Bay Area project began, the City was in the process of developing a Sustainable Streets Plan. This plan combined two other city planning efforts, a Complete Streets Plan and a Green Streets Plan, into one comprehensive plan. The Complete Streets Plan balances development and redevelopment of all modes of transportation including pedestrian, bicycle, cars, and public transportation in order to create streetscapes accessible to all transportation modes. The Green Streets Plan creates a blueprint for urban greening and returning some more natural watershed function and attributes to the cityscape. One of the primary benefits for urban greening and implementing green infrastructure is to improve the water quality of stormwater runoff that drains to the Bay. In addition, the City also desired other green infrastructure benefits such as beautification, increased areas of urban habitat, and traffic calming that can help reduce the cost to benefit ratio associated with green infrastructure implementation. Together, these plans create a re-visioning of urban streets for planning and integrating transportation modes with urban greening. The Project Team (staff from the City of San Mateo and City of San Jose, other municipalities, BASMAA, and technical advisors) held three meetings to identify Toolkit needs and useful functionality that would be most essential for city planning efforts. Site Locator Tool recommendations from the TAC included adding public/private ownership delineations on map outputs, enabling the Regional Base Analysis an optional part of the Tool, and identifications of useful data layers for running the Tool. Once the beta version of the Site Locator Tool was developed, the development team worked with the City of San Mateo to start the pilot effort. One of the primary goals for San Mateo was to identify potential GI locations for inclusion in the Sustainable Streets Plan (Figure 2-1). Since this plan was focused on redeveloping streetscapes, the most useful data pertained to street width, sidewalk width, existing sidewalk planters, and areas of damaged streets and sidewalks that could be considered for future repair. San Mateo plans to capitalize on combining Green Infrastructure with multiple modes of transportation so the City wanted to include existing and potential pedestrian paths (along with streets and sidewalks) as potential GI locations. The City was most interested in identifying locations for bioretention features so this feature type was selected and run through the various analyses. The City elected to include the Regional Base Analysis in the Tool run. This analysis removes locations for consideration that don’t meet the base criteria which can result in the exclusion of many locations that could be areas for GI but may need additional engineering. Figure 2-1. 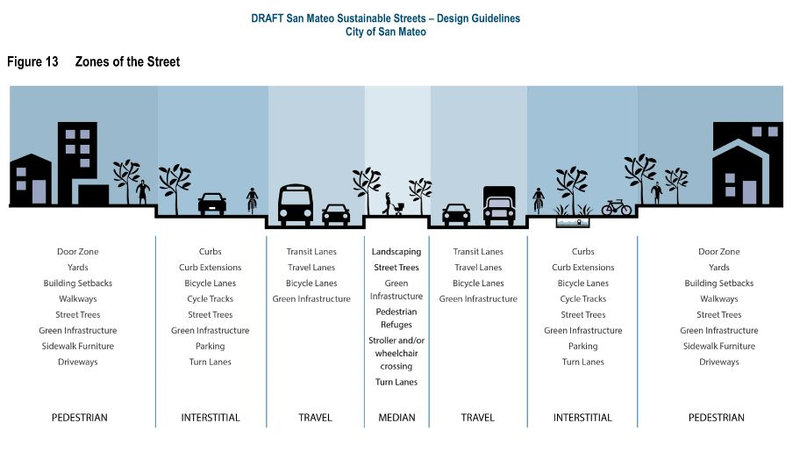 Design guidelines for City of San Mateo street zones including planned zones for Green Infrastructure implementation (Courtesy of City of San Mateo). 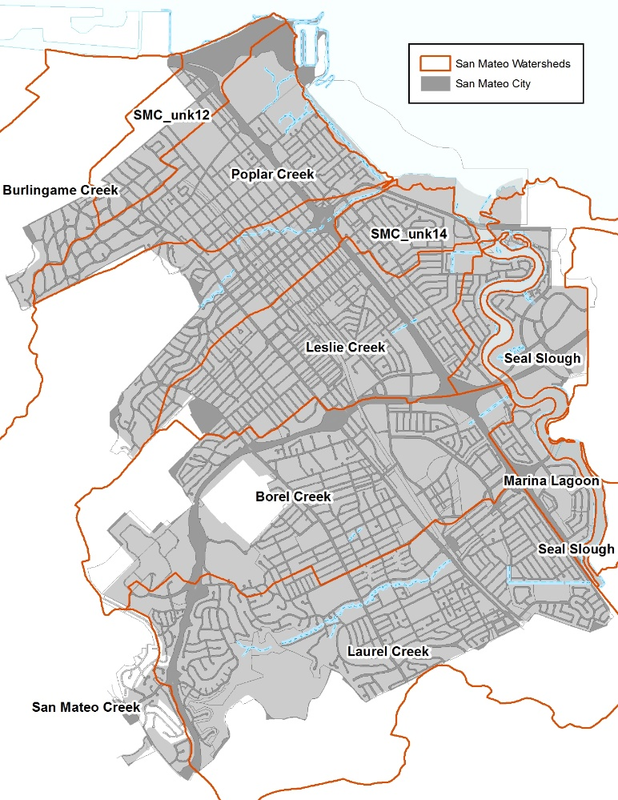 In San Mateo, the GIS Site Locator Tool was demonstrated in five discrete watersheds including Borel Creek, Laurel Creek, Leslie Creek, Poplar Creek, San Mateo Creek, as well as multiple unnamed drainages (Figure 2-2). The GIS Site Locator Tool integrates regional and local GIS data and uses these data, through an identification, ranking and weighting process, to locate potential GI locations at a watershed scale. Data accuracy is an important determinant in the accuracy of map outputs produced by the Tool. The quality, scale and accuracy of the input data will determine the quality, scale and accuracy of the output maps. Therefore, it is highly beneficial to use more accurate and local data when available. When using more regional scale data layers for analyses, such as the opportunities and constraints ranking analysis, the user can weight and rank these layers to reflect the confidence in local accuracy of the data. There are many regional GIS data that are included in the Tool (Table 2-1) and additional regional data sets can be added as well. Local data sets can be added to the Tool in order to help identify potential locations that meet the goals and planning needs of each city. Each municipality will identify a set of questions or goals to answer or meet prior to running the Tool. These questions or goals become the drivers for deciding which data sets to include. Figure 2-2. Map showing City of San Mateo watersheds and drainage areas included in the demonstration project. Orange lines delineate each watershed boundary. Note that some watershed boundaries are outside the City. Table 2-1. Regional GIS data layers included in the Site Locator Tool. From ABAG's data webpage. Priority Development Areas (Current) - This feature set contains changes made to Priority Development Areas since the adoption of Plan Bay Area. DO NOT USE this feature set for mapping or analysis related to Plan Bay Area. For the city of San Mateo, the primary driver for implementing GI was the Sustainable Streets Plan. Since this plan focused on streetscape redevelopment, spatial data that quantified street and sidewalk attributes and integrated Complete Street concepts were important data for inclusion in the Tool. The City elected to run each of the Tool analyses including the Regional Base Analysis. The City also included a data layer that identified City-owned parcels in the ownership analysis which allowed for a public/private delineation of locations in the map outputs. The last analysis removes areas that are not feasible GI locations such as wetlands, riparian areas, and areas with utility mains close to the surface. The City excluded all areas intersecting existing wetlands and the San Mateo Lagoon in this analysis. Table 2-2 shows the regional and local GIS data layers included in the Site Locator Tool for the City of San Mateo. Running the Site Locator Tool with the City of San Mateo was an iterative and interactive process. The first round of conversations with the City focused on identifying street data that had spatial attributes for measuring existing street width. During subsequent conversations, additional data sets such as existing and potential pedestrian trails, sidewalk width, areas of existing sidewalk planters, and regional bike facilities in or identified as additional data that captured certain aspects of the Sustainable Streets Plan. This progression shows how GIS data layers can be added and removed, rankings and data layer weights can be changed. Additionally the Tool can be rerun by including or excluding any of the analyses. This iterative process can be refined as questions and goals change or more accurate local data are available. Based on selected regional and local data layers and the City’s ranking and weighting of these layers, the Site Locator Tool identified 18 acres of City-owned property or right-of-way as highly ranked locations for potential GI implementation, 113 acres as moderately ranked, and 11 acres as lower ranked locations (Figure 2-3). In total, 142 acres were identified as potential locations for Green Infrastructure. Higher ranked sites were the result of relatively higher factor weights on Priority Development Areas and funding opportunity data layers. Table 2-2. Local and regional GIS data layers included in the Site Locator Tool for the City of San Mateo. Sidewalk Polygons (Where there is no width attibute from the San Mateo Sidewalk layer, and minimum dimention of sidewalk compoents from the San Mateo Sustainable Streets report are assumed). A 100ft buffer from a subset of San Mateo's Facility polygon layer where FACTYPE is = to "PARK"
San Mateo and SFEI performed a remote data validation exercise in order to see how the Tool ranked areas previously identified for potential GI implementation. Specifically, Grant Street and Fremont Street were investigated to determine why one street ranked higher than the other. Grant Street was ranked higher than Fremont Street since it had a planned bike lane, which was given a higher weight in the Opportunities and Constraints Analysis. Delaware Street and Bay Meadows were unranked in the output because they were excluded as possible locations due to site characteristics deemed not feasible for implementing GI. Overall, many of the sites identified and ranked highly by the locator tool were also sites that were previously identified as potential GI opportunities by San Mateo. Furthermore, additional high ranked locations were identified which provided the City with additional locations to investigate further and to compare to the current GI plan.